There are only a few musical instruments that have changed music and defined a sound. The electric guitar, the moog and certainly the Hammond Organ would be on that list. 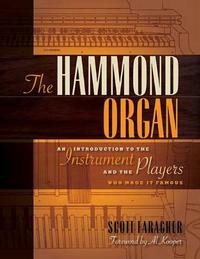 This book is really highly recommended for the fan of the Hammond Organ and the music created using the instrument. The first half of the book is a detailed historical look at the creation and evolution of the instrument. It really is a great tribute to Mr. Hammond himself in a lot of ways. Additionally, it’s quite detailed in terms of different models of the Hammond Organ and the Leslie speaker. The second half of the book focuses on musical artists who have recorded using the Hammond Organ. It includes bios of the artists and limited discographies. If you love the Hammond Organ sound, you really need to get this book. It’s also recommended for those looking for a new view of music in general. This book is quite well done, and really showcases an important musical instrument in a spotlight which it deserves.